Don’t have time to read? 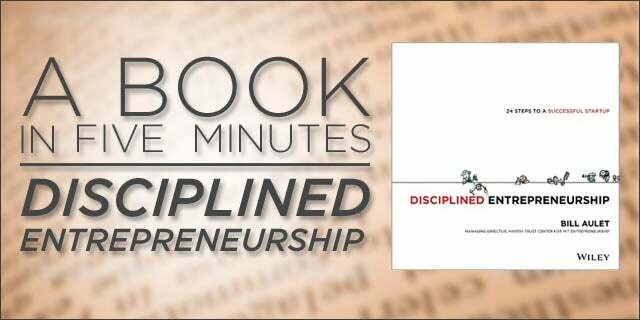 Here’s a quick but comprehensive summary of Bill Aulet’s “Disciplined Entrepreneurship: 24 Steps to a Successful Startup,” released on August 12.
Who should read this: First-time and serial entrepreneurs who are looking for a solid product-market fit. Elevator pitch: This 24-step guide to product-market fit is based on a process that Aulet has been refining for years while teaching. Entrepreneurship is chaotic and unpredictable, and hopefully this will bring some method to the madness. Author: Aulet is the managing director of the Martin Trust Center for MIT Entrepreneurship, which supports entrepreneurship education at MIT. Aulet has spent his time there teaching entrepreneurship and designing new classes, competitions, and accelerators. Previously, Aulet spent 11 years at IBM and got his real-life experience as a successful serial entrepreneur. First off, entrepreneurship can be taught. Building a product is key to entrepreneurship, and that process is learnable. Other myths that entrepreneurs should reject include the role of the individual (in fact, multiple cofounders are more successful than solopreneurs) and the role of charisma (communication, recruiting, and sales skills are much more important). This book will focus on innovation, which means taking an invention and commercializing it. That invention can be an idea, a technology, or some intellectual property. 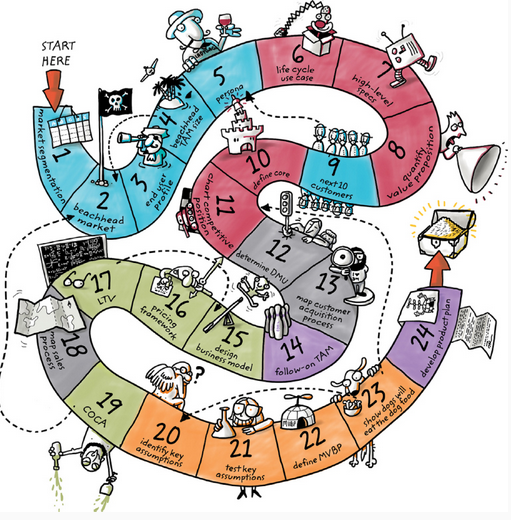 The 24 steps address six key themes: Who is your customer? What can you do for them? How do they acquire your product? How do you make money off your product? How do you design and build your product? And how do you scale? There are three starting points for entrepreneurship: a technology, idea, or passion. If you have a passion but no specific idea or technology, do some introspection to figure out the best use of your knowledge, skills, connections, financial assets, and work experience. To segment your market, start by brainstorming possibilities. Your target should include not just the industry, but the specific type of user, their location, and other characteristics – e.g., 25- to 34-year-old men in Boston who play video games at night. Your best bet is to go after a new market, rather than trying to sell to everyone or snag part of a huge market. Then, narrow the list down to 6-12 markets based on whether those customers have money and a reason to spend it, whether you can reach them and beat the competition, what possibilities they open up in other markets, and your interest in them. Finally, do research on those markets by talking to your potential customers and observing them, making sure to be open to new information and not selling them on your solution. This process should take at least a few weeks. To select a beachhead market, use the same criteria as before: whether those customers have money and a reason to spend it, whether you can reach them and beat the competition, what possibilities it opens up in future markets, and your interest in it. Smaller markets tend to be better, and it’s crucial that you pick just one and ignore the others (for now). Then, further segment your chosen market until it meets these conditions: customers buy similar products for similar reasons, and they talk to each other (for word of mouth). To profile the end user – who isn’t necessarily the buyer – narrow them down to a specific demographic, including things like age, location, income, habits, backstory, and motivations. It’s ideal if a founder, or at least an employee, fits into this category. The TAM is the amount of annual revenue you could earn if you achieved 100 percent market share, which equals number of users times revenue. Calculate number of users using bottom-up (customer lists, trade associations) and top-down methods (market reports) to verify. Calculate estimated revenue based on what your customers spend already and how much value you’re providing. You should aim for a TAM of $20-100 million; if it’s more than that, you need to segment further. Describe not just how your Persona uses your product, but how they discover a need for it, find out about it, analyze it, acquire it, install it, get value from it, pay for it, get support for it, buy more of it, and tell others about it. Create a visual representation of your product: storyboards or wireframes for your website, or diagrams for your device. But don’t build anything yet or get too specific – the goal here is simply to iron out disagreements and misunderstandings among the team. Then, create a brochure that focuses on features and, more importantly, how they benefit the customer. Make a diagram that shows the status quo as well as the quantitative benefit the customer gets out of your product – in time, money, or whatever their top priority is. Use real numbers. Err on the side of underpromising and overdelivering. Try to identify 10 customers who are similar to your Persona and willing to buy. You do this by actually talking to them and trying to validate your full lifecycle use case, product specification, and quantified value proposition. If they’re on board with everything, then you can ask for a commitment to buy; if not, go back to the drawing board and revise your assumptions. (That’s part of the process; after all, your assumptions are only estimates.) If you have tried and tried and can’t find 10 customers, it’s possible you need to change your Persona or even look into a new beachhead market. Explain your Core – your “secret sauce” that competitors can’t duplicate easily. It will become the focus of your efforts and shouldn’t change very much. It might be the network of users you’ve built up, fantastic customer service, low cost, or user experience. It usually isn’t your intellectual property, speed of innovation, first-mover advantage, or exclusive contracts with suppliers. Make a competitive positioning chart: a two-dimensional graph that plots the customer’s top two priorities on either axis. Put yourself and your competition (including “the status quo”) on the map – you should be in the top right corner. And make sure your competitive position makes use of your Core – if not, you may need a different market opportunity. Map out all the people who influence the purchasing decision: from the end user to the primary buyer to champions, as well as other influencers, people with veto power, and the purchasing department (for B2B). You may have to learn to sell to or at least neutralize some of these other parties. Create a step-by-step timeline of how a customer will determine a need for your product, find out about it, analyze it, acquire it, install it, and pay for it. Estimate how long the sales cycle will be, and any big obstacles you might encounter in budget, regulations, or compliance. Make a list of about five or six markets to enter after your beachhead market. They can involve selling other products to the same customers, or selling the same product to an adjacent market. Calculate their size the same way you did in Step 4, but without devoting as much time to it (maybe only 1/10 of the time). To raise money or build a big business, the overall TAM of your beachhead and follow-on markets (less than 10) should be over $1 billion. A business model is how you extract value from customers, and entrepreneurs don’t spend enough time thinking about this. Take a look at existing business models, like subscriptions, upselling, advertising, transaction fees, and micropayments. Remember that freemium and “we’ll figure it out later” aren’t business models. Then, brainstorm your own innovative model, and pick a good one – it’s hard to change later. Estimate a price based not on your costs, but on the value you provide – a good estimate is around 20 percent of that value. Also take into consideration key prices in the DMU (like budget caps) and the price of your competitors’ products. Remember that you can offer different prices to different customers, and make sure to give discounts to early testers or influencers. Finally, it’s better to have a high price and lower it later than vice versa. Calculate the LTV based on revenue streams, gross margins, retention rates, the life of the product, rate of re-purchasing, and the cost of raising funding. The last is crucial and expensive: startups pay a lot in equity in order to raise money. You’ll discover that factors like your business model, gross margins, retention rates, and ability to upsell have a large effect on your LTV. Figure out how the sales process will work in the short, medium, and long term. In the short term, you are generating demand on your own, often using salespeople or inbound marketing, email, and social media. In the medium term, orders flow in regularly and you can focus more on retaining existing customers; you may use distributors at this stage. In the long term, you’re mostly focused on client management. COCA is hard to calculate and perennially underestimated but crucially important, as a too-high COCA can kill a business. Calculate COCA from the top down: your overall sales and marketing costs divided by the number of customers you acquired during that time. To reduce your COCA, think about reducing direct sales, automating customer acquisition, improving conversion rates and lead quality, decreasing the sales cycle, and generating word of mouth. Brainstorm your 5-10 top assumptions that haven’t been tested. Design the cheapest, quickest, easiest tests you can think of to refute or validate your key assumptions. Take your MVBP to customers and show that they will buy it, get engaged with it, and recommend it to their friends. Track metrics on all of these. Take some time to plan what features you’ll add to the MVBP for your beachhead market, and what adjacent markets you’ll enter next (and how you’ll have to adapt the product for them). Don’t spend too much time on this – the idea is simply to think about your options. This is the book that many of us have been waiting for: a systematic guide to entrepreneurship. Aulet distills concepts and tactics from many other books, as well as his own experience, into 24 clear and doable steps. The language is a big jargony at times – your head might spin as you try to distinguish your End User, Target Customer, Persona, TAM, and Core – and the whole process seems like a lot of work, but no one said entrepreneurship is easy. The book is especially useful for understanding key metrics that investors will want to know. Aulet backs up his advice with examples from his own experience at SensAble, as well as businesses designed by his students. Plus, each chapter has a cute cartoon to illustrate the point. And entrepreneurs will be nodding their heads along with the conclusion – the injunction to get out of the building and take action, because that’s what entrepreneurship is all about.